The straining medical system in the United States wastes a whopping 750 billion dollars per year, according to a major report by the highly revered Institute of Medicine that was heavily ignored and washed over after it was released three years ago. Now surely that’s a big number, and it’s really concerning just considering this fact — but I want to put this figure into perspective for you. After all, it’s hard to envision a billion dollars let alone 750 billion. The amount we’re talking about here is not only more than the entire budget for the US Department of Defense, or more than the 2008 banker bailout that everyone is so upset about. It’s also enough to completely cover healthcare costs for 150 million US workers. 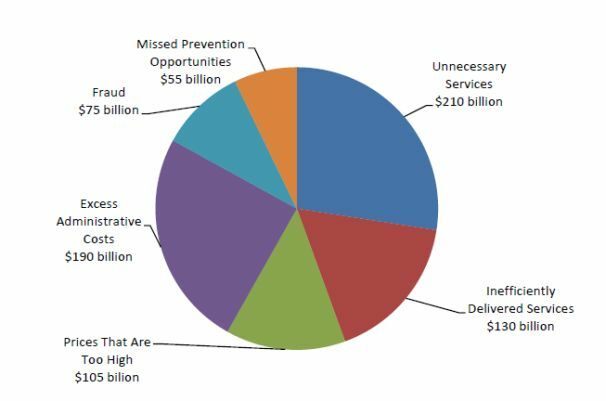 Over $75 billion is wasted in straight up fraud. A total of $55 billion or more is lost due to lack of preventative education and opportunity. More than $190 is blown on unnecessary paperwork and administrative costs. A plentiful $210 billion is spent on what has been deemed ‘unnecessary services,’ as in repeating tests over and over for really no reason. All in all, we’re looking at 30 cents for every dollar being tossed into the waste category of the US medical system. But, of course, someone is cashing out. Remember that $55 billion lost due to the lack of actual prevention education and opportunities? That generates major funds for the mega drug companies who will immediately jump at the opportunity to treat the patient for the new disease that formed as a result. We’re talking about companies that really don’t even care about $11 billion dollar fines. The bottom line? It’s not just about blowing more money than the Defense Department budget or making the 2008 bailout look like child’s play. From the report, we also find that the lack of true quality on our medical system’s care is costing lives. Despite medical ‘advancements,’ it seems that people are getting more sick.